The section “Dijkstra-Malabar” of this website, aims to give regard to the work and circumstances of Klaas Dijkstra’s "30 years of Radio commitments". From which he spent nearly 25 years in the Dutch East-Indies' Radio Communications Services (colonial PTT)(1920-1945). He worked for many years on this manuscript, and they never seriously credited him for it. Material on: Malabar and the Radio services in former Dutch East Indies can be found on internet. However, inside views are normally very hard to disclose. I have made a temporary selection on the photographic material from Klaas Dijkstra’s private archive. He made several versions of his “opus magnum”, of which a shorter version is published in November 2006 (consider the top of Dijkstra-Malabar main page). Dijkstra made a very comprehensive private manuscript, of which some material has never been published before. For us luckily, Dijkstra was a talented amateur photographer, too. When he was on his second “tropical leave” in Holland, in 1935, he left a suitcase full of documents behind. This material would otherwise, most likely, have been lost during the Japanese occupation of Indonesia (1942 - 1945). We will focus, for this occasion, mainly on the construction work done on Dr de Groot’s huge Poulsen arc type transmitter. They worked continuously day and night on the coil constructions. 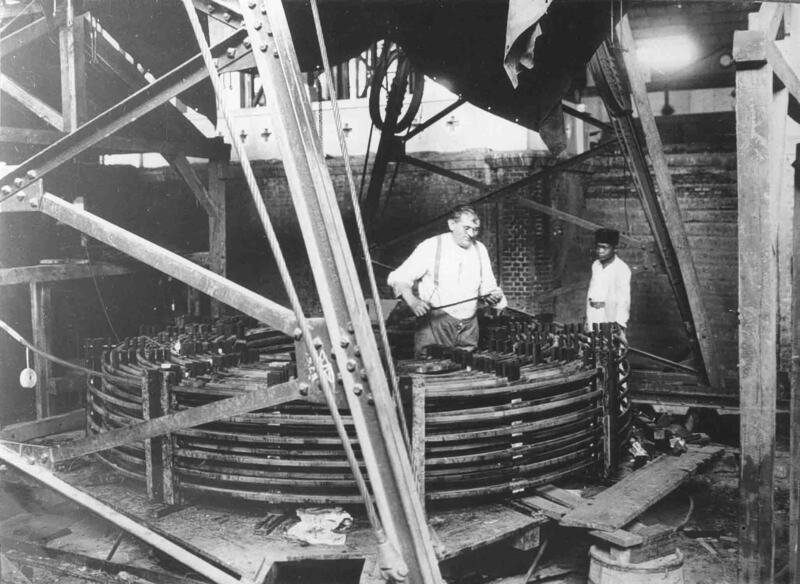 The upper coil was Dijkstra’s first task in East-Indies (early 1921)(he designed it). Its weight was 10 tons and the coil diameter was 3 metres. I have placed the photos against the line drawing below, in a logical order. The upper coil did not have a function in the frequency domain. It has a magnetic bias function only, and was fed with a constant DC current. Two difficulties had to be countered: the accumulation of heat inside the screened coils; and its electrical insulation properties. All sound simple to be solved, but during those days Dutch East-Indies was, technically, a remote place. Everything had to be ordered via the Ministry of Colonial Affairs in the Hague (NL). Which procedure caused, generally, a delay, between a requirement and its acceptance, of at least 9-12 months. That is why they chose for local available ebonite insulation material, which is, however, inferior compared to ceramics. Met het wikkelen wordt gestadig doorgegaan, dag en 's nachts. De corpulente persoon links is de instrumentmaker Lazarus Potcognak (Tsechoslovaak). Mr Potcognak did all the delicate work by himself. The principle circuit shown above shows, that the lower coil section is a part of the high frequency (RF) circuit. Dr. de Groot used hydrogen in the Poulsen arc-chamber. What is not well known is, that commonly one often used, for instance in the States, in those days, inferior petroleum instead. Dr de Groot visited in 1917 the United States on his trip back from Holland to Dutch East-Indies. The Mediterranean sea was not safe enough due to World Ware One. During that trip he purchased some Poulsen arc transmitters (100 kW types)(He might even have met with Mr Poulsen). These transmitters were still operational in the early 1920s. A particular downside was, that after some four hours of operation, the transmitter had to be switched off, to allow cleaning of its arc-chamber. Which was a rather dirty job! Details of the frame construction of the 2400 kW Poulsen arc type transmitter is easy to understand. 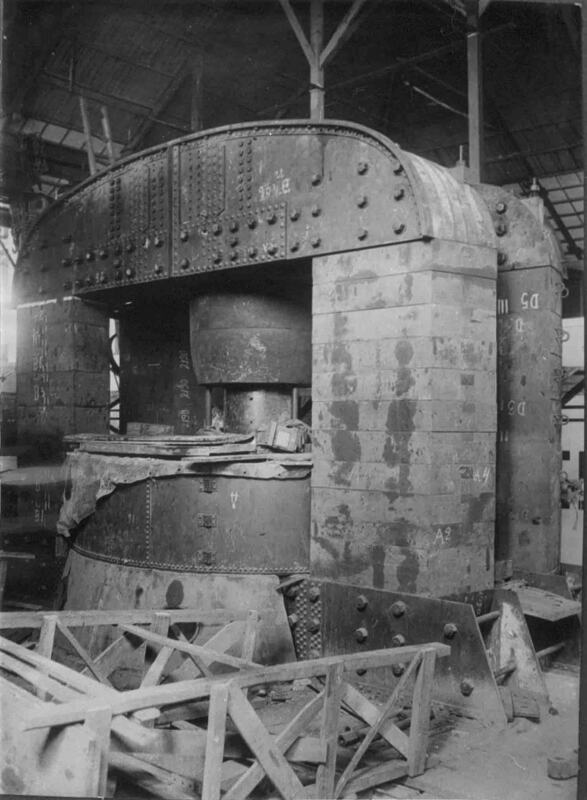 The lower coil is mounted in a so-called “oil bath”. According Dijkstra, for cooling reasons. Quite embarrassing was, that when the arc-chamber had to be built into the main frame structure, that they discovered that the diameter of the centre magnet-poles (of 1 metre diameter!) proved to be too big for the centre hole of the bronze arc chamber. 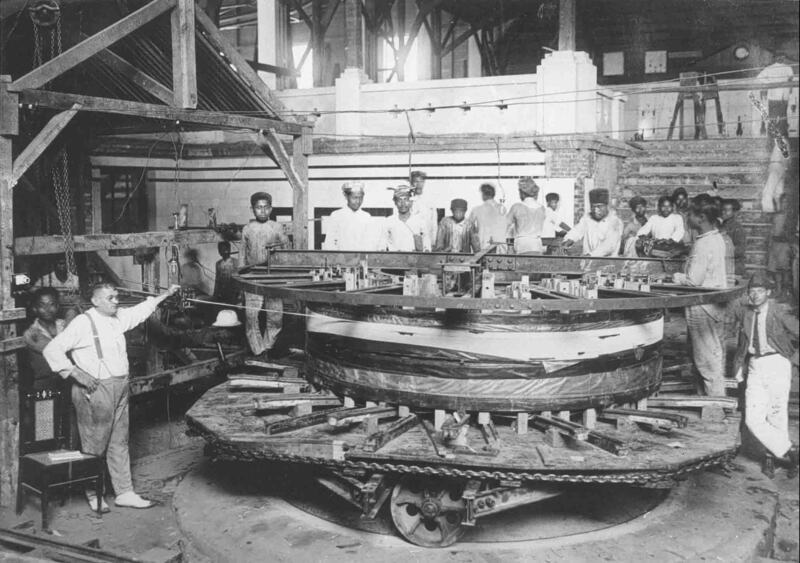 However, there existed in Indonesia, in those days, no lathe that could handle a size of a diameter of 1 metre! Consequently, one had to file (chafe), by manual means, until the centre rod could fit inside the arc-chamber! This work took several months. Mr L.W.H. van Oosten was, likely, the first person in whole East-Asia, who received the radio message (telegram) of the “Armistice” in Europe, on 11 November 1918. 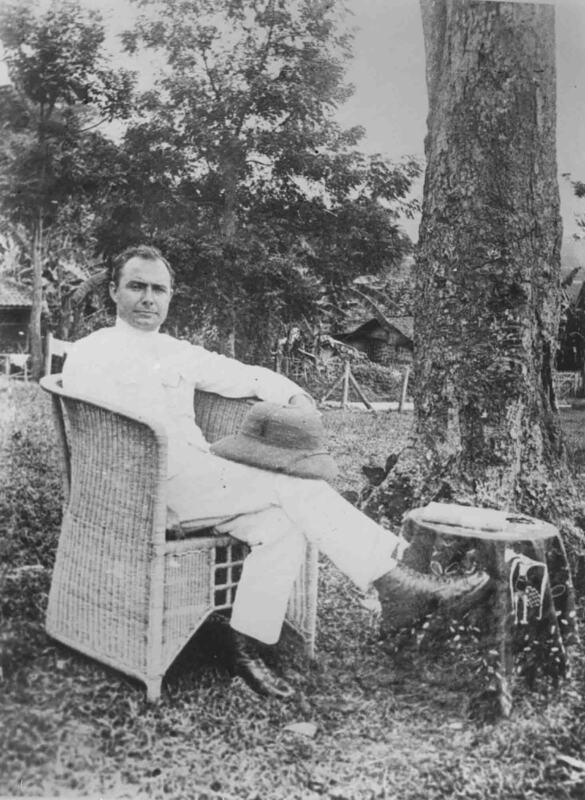 He was stationed on a small (Indonesian) island just near Singapore. Via his connections, they passed on this message to Singapore. The regular British message arrived there some 20 hours later! This does not mean that the Dutch East-Indies Radio Services were better off than their British colleagues! He had, irregularly, experimented with his receiver during he was on his radio watch. He was a colonial PTT employee. Their response was, to object his “unauthorised” behaviour and to give him a very serious official telling-off! However, after Dr de Groot heard about it, he turned the embarrassment down, and Mr van Oosten now received instead special compliments from the highest PTT authorities in Batavia (which was the capital of Dutch East-Indies, now Jakarta). De heer L.W.H. van Oosten, radiotelegrafist bij de P.T.T. Dienst in Ned. O. Indië, is vermoedelijk de eerste in de gehele Oriënt geweest, die het radiotelegram over de wapenstilstand ontving, die op 11 November 1918 in het bos van Compiegne werd gesloten.